LED EMC BasicsWHY LED EMC's? LED electronic message centers (EMCs) are a marketing breakthrough that rapidly create interest and drive revenue growth. Now more than ever, business owners must be thoughtful about how they spend advertising dollars, getting the maximum return on their marketing investment. LED signs create a market-changing position that grabs attention and makes people take action. AdChoice LED Signs’ EMCs create customer draw that will increase traffic, opportunity, and revenues for any business. LED signs bring results. Some promise the world, we deliver it. “The bottom line.” It’s a phrase we hear too often that tends to lose its meaning. If we asked what is the most important part of your business, or any business for that matter, we would hear a multitude of factors and considerations. In the end, however, the only thing that really matters is the bottom line. Profit. Margin. It is a fact: most business owners get caught up in details, and many of those details border on irrelevancy versus the bottom line. You spend hundreds of thousands of dollars, possibly millions on your location, product lines, real estate, and payroll. The ONLY thing that truly matters is bringing more buyers from “out there” into your facility to spend their money on your products and services. That is the most important factor to positively impact your bottom line. Nothing—NOTHING—else matters in the end besides bringing in more buyers to your business. Don’t get lost in the details. Drive revenue and profits with an LED message center. Consider the big picture. Are you are nearly invisible to the large majority of the passing public? Is your traditional sign failing you? Take a moment to think of yourself driving down the road. You drive by hundreds if not thousands of businesses in the course of a week. Exclude the “big box” retailers and consider the names and products of 10 other companies like yours that you pass by. Did you come up empty? Just like your sign, you pass by and they are invisible to you. If one thousand cars pass your sign, maybe a hundred “glance” at your sign, while nine hundred or more look at and read what is on an LED message center. Once you invest in LED advertising, you will no longer hear, “I didn’t know you were here.” Digital billboard advertising has been proven to be the most effective way to gain visibility and the attention of customers passing by. One of the most significant mistakes business owners make is assuming the passing public knows of their company and what products and services they have to offer. Whatever your current signage reads—Louie’s Pizza, Cramer Storage, Family Pools—it delivers an extremely limited view of your true product and service offerings. That minimalistic message is likely a very small percentage of your actual offering. A digital advertising display provides a fantastic tool to educate passing prospective customers on ALL the products and services you have to offer. Push high margin products, dump excess inventory and clearance items, emphasize customer retention service offerings, easily fill any job opening. The advantages are endless. As a business owner, you need to remember all of those “staple customers” who have disappeared over the years (i.e., those who have moved away). According to the US census Bureau 18% of the population relocates every year—that is a significant number over the course of a few years! The new people who have moved into the area don’t know who you are or what you have to offer. This customer turnover drives losses in most businesses that are not constantly and effectively driving new client acquisition. Nothing educates your customers on your product offering better than electronic advertising via an LED screen. The integral piece of marketing that goes hand in hand with “educate” is motivate! Certainly, having the public know what you offer is a step in the right direction, but it is only a small step. Motivating your prospective customers with new products and specials to come and do business with you is the end game. THAT is where an LED message center stands alone at the top of the list, far above all other marketing and advertising media. Nothing compares to an LED message center in the standard metric of cost per million views. Nothing compares to the impact an LED message center has on the most important people, the customers who live in your area and drive by your facility on a regular basis. These are your best prospects. These are the people you want to motivate to come in and do business with you. Nothing compares to the impact of an LED message center when it comes to driving those prospects and customers into your facility. Customers are the key to success. The larger the customer base, the more successful the business. An AdCenter EMC provides the most effective, targeted advertising available to drive customer acquisition. Sales growth means a rapid return on investment and revenue growth. An AdCenter EMC creates visibility for your business like no other medium. Never sick or on vacation, an AdCenter EMC sells your products and/or services 24/7 – 365. 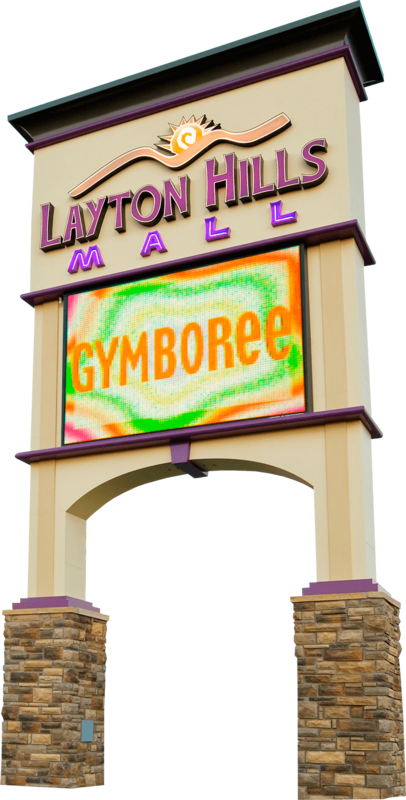 LED sign messages are targeted to your region and your most likely customers. An AdCenter EMC breeds loyalty, bringing in customers now and in the future. More dynamic than a traditional sign or billboard, an AdCenter EMC can display several messages at once. EMC messages are changeable, adaptable, and flexible. The power is in your hands: You control the timing and the message on an AdCenter EMC. AdChoice LED Signs are a powerful investment that bring the fastest return from a first impression. Newspaper advertising costs over $1.50 per 1000 viewers. Television advertising costs over $6.50 per 1,000 viewers. Radio advertising costs more than $5.50 per 1,000 viewers. AdCenter EMC costs less than $0.15 per 1000 viewers. AdChoice LED EMCs are the most economical mainstream advertising avenue. How Do LED Signs Compare? Other advertising methods have a limited ability to target audiences in specific territorial locations. Your investment in traditional forms of advertising is spread to places from which you may not want business, or demographics that don’t match your target audience. The return on investment is limited with broad advertising efforts. 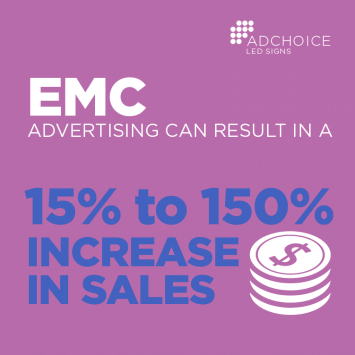 With an AdChoice LED Signs EMC, you have the ability to advertise to your location. The viewers who see your messages are those most likely to generate leads. The closer people are to your business, the greater the chance they stop in. AdChoice LED Signs target those potential customers and get them to notice your business. This increases the return on investment immensely, since EMC viewer leads have greater potential to convert to new sales than far-flung leads from newspaper, radio, or TV advertising. The benefits of your AdCenter Series EMC will become self-evident. Your customers will attest to the fact that it is impossible to pass your EMC without reading it. Opportunity for promotion and revenue growth is enormous. Don’t pass up the opportunity of advertising with an AdCenter Series EMC. Does investing in an AdCenter Series EMC make sense for your business? Do the math first! A U.S. Small Business Administration study concludes that businesses investing in LED EMC technology realize revenue growth between 15% and 150%. What would an increase in revenue of 15% this year mean for your business? What would it look like over the next ten years? No other advertising method delivers the ROI of an AdCenter Series EMC. Attracting new customers is the most important factor in a healthy business. 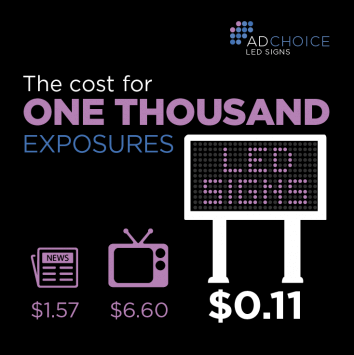 An EMC from AdChoice LED Signs can increase sales and pay off that initial investment in record time.